When Nathan was little, it seemed like he talked non-stop, especially when he was with me. I can remember telling him now and then that my ears needed a break because I wanted quiet so I could just think for a moment. Once we were driving down the road and I convinced him he should try to see how long he could go without talking. He didn't even last 20 seconds! To be honest, it was overwhelming at times. He's almost 10 now and still talks a lot, but not quite that much, thankfully. Most people don't talk so much that it's overwhelming for the people around them, but we do all talk many times throughout the day. We talk to family members, friends, neighbours, store employees, co-workers, doctors, waitresses and more. We talk about the weather, our kids, our work, our hobbies, politics, the news and much more. Most of the time, our conversations are fine, but sometimes the things we say are not quite so fine. We may say things out of anger, irritation or impatience that are the exact opposite of fine. Things that we are horrified to hear come out of our own mouths. This is nothing new, of course. James wrote, "Anyone who is never at fault in what they say is perfect, able to keep their whole body in check" (James 3:2). James also wrote, "With the tongue we praise our Lord and Father, and with it we curse human beings, who have been made in God’s likeness. Out of the same mouth come praise and cursing. My brothers and sisters, this should not be. Can both fresh water and salt water flow from the same spring? My brothers and sisters, can a fig tree bear olives, or a grapevine bear figs? Neither can a salt spring produce fresh water" (James 3:9-12). This should not be. And yet it is. Why? I read this portion of Matthew recently and I think it can shed some light on why. "Make a tree good and its fruit will be good, or make a tree bad and its fruit will be bad, for a tree is recognized by its fruit. You brood of vipers, how can you who are evil say anything good? For the mouth speaks what the heart is full of. A good man brings good things out of the good stored up in him, and an evil man brings evil things out of the evil stored up in him. But I tell you that everyone will have to give account on the day of judgment for every empty word they have spoken. For by your words you will be acquitted, and by your words you will be condemned" (Matthew 12:33-37). Jesus was talking to the Pharisees, who were accusing Him of using Satan's power to cast out demons. He didn't have much time for the religious leaders of His day, here calling them evil and a brood of vipers, while at other times He called them hypocrites and whitewashed tombs (see Matthew 23). What interested me in these verses was the idea of our words as fruit, rooted in our hearts. You see, as Christians, we have the Holy Spirit indwelling us, which should result in all of our words being good fruit, born from the goodness in our hearts. But as I've said, that's not always the case. So what's up? Well, unfortunately, our sinful human nature is sitting right there beside the Holy Spirit, trying and trying to force its way back out into the open. When we are angry, irritated or impatient, we sometimes tap into that as the source of our words, rather than the Holy Spirit. 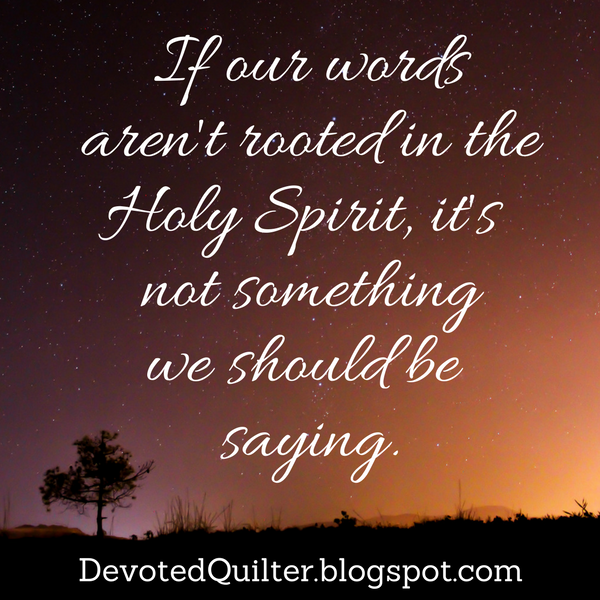 When we allow the Holy Spirit to be the source of our words, the fruit is good. But when we allow our sinful nature to be the source, the fruit is not good. This is one reason why stopping to think before we speak is such a good idea. If we're not spewing words in the heat of the moment, we can pay attention to where our words are coming from. What source are we tapping into? If it's not coming from the Holy Spirit, it's not something we should be saying. Or as a friend says, "I have yet to read the part where the Lord said, "Let there be gossip...." While avoiding gossip is not a challenge most of the time, I do say other things I regret. Nearly every time, it comes back to pride for me, I want to be first to know something, the cleverest or funniest person at the table, or just RIGHT, when it doesn't matter or it isn't the time to point out someone else's fault. Great reminder.